With our rich industry experience, we are engaged in supplying an extensive assortment of Thermocol Block Molding Machine. The provided machine is manufactured using the optimum functionality components and with the aid of advanced technology under the surveillance of our skilled professionals. 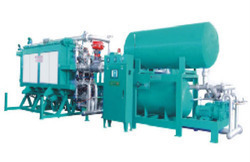 Available in diverse specifications, this molding machine is used for making thermocol. Additionally, our esteemed patrons can avail the provided machine from us at reasonable price. Incepted in the year 2014, in Vadodara (Gujarat, India), we “Arya Packagings” are the reckoned manufacturer and supplier of an enhanced quality Thermocol Boxes, EPS Thermocol, Thermocol Products, Thermocol Packaging Sheet, Thermocol Making Machines, etc. Being the most respected organization, we have set business up as a sole proprietorship. Our offered products are manufactured by making use of expanded polystyrene material and thermocol sheet with the help of modular machines in compliance with set industry norms. These products are widely used for packaging purpose in various industries such as electric, medical, food & agro, etc. The offered products are made available in different specifications of sizes and dimensions as per the necessities of our clients in specified manner. Further, these products are checked for their quality on series of quality parameters before being supplied to our clients assuring their flawlessness at user’s end. Our offered products are widely appreciated by our clients for their number of features such as light weight, easy to use, crack resistance, safe to use, moist resistance, reusable and durability.